"FLOOZY" HAS MORE STYLE THAN "HO"
Earlier today I posted a few of my RANTORIUM EMPORIUM images up over at The Brat in the Hat, one of them was the one below called "Retro Ho - there's no floozy like an old floozy!" For some reason this one tickled quite a few of my readers - the mail I got indicated the word "floozy" had touched a cord in my readership, especially those of us categorized as "boomers". One of the comments was from a dear friend and my fellow Boomer Babe, Joyce Mason who commented, "Ho-ly cow! Tim and I love the word "floozy. . . ."
I am very fond of the word "floozy", it has a certain caché all it's own, lol. In fact, I have a little story about that word and how it started one of the silliest and biggest belly-laughing conversations I've ever had which you "floozy" fans might enjoy. After you read it you'll understand my tag line on the image above "there's no floozy like an old floozy. A friend and I were enjoying some Cherry Martinis some time back and we got off on the subject of "women of ill repute". Don't ask me how the conversation got around to that subject, we were, after all, well into our third martini at the time. 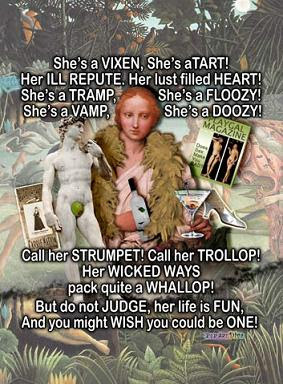 Tramp, Trollop, Strumpet, Floozy, Tart, Jezebel, Hussy, Harlot, Wench, Chippie, Working Girl, Vamp, and Concubine as well as the terms of "soiled dove", "woman of ill repute", "fallen woman" and "shady ladies". We were laughing and pointing at each other as we called them out. It was totally goofy and totally fun and we were laughing like a couple of mad women at the archaic terms. I suppose we would not place ourselves in any of those categories and, therefore, it was hilarious to fling them at each other. Afterwards I got to thinking (yes, I know, thinking always gets me into trouble), but I thought, I like those words. They carry a kind of romance that is absent in our present day vernacular, they have a touch of understanding and humor - maybe because of the eras they come from. In times past there were only so many jobs a woman could take if she had no husband, family or community to support her. Her choices were pretty much limited to being a teacher, a cook, a seamstress, running a boarding house, taking in laundry or become a "fallen woman". If you had no education or money most of those jobs were out of your reach. If you didn't want to starve there was often only one choice. (Read "Soiled Dove Plea"). In today's world we are not so limited, but it is only recent history where that change has occurred. Had I been born 100 or so years earlier my life would have been a whole different story! If I had the kind of temperament I have in this century I doubt, very sincerely, if I would have become a farmer's wife, a seamstress or a teacher. I cannot see myself plowing a field, I hate to sew and a school room full of kids is not my idea of a great job. Plus, my personality does not lend itself to being good wife material! I am convinced I would have eventually become a Madam in some Honky-Tonk in one of the "big cities". I like business, I'm pretty sociable, I like to have a drink now and then, I like flashy clothes, I like to paint my face and I like gambling towns. That pretty much points to career in a past life as the proprietor of a house of ill repute. Of course, being the control freak that I am I would have to be the Madam. I am not one to "work in the field", I'm better at giving orders and letting others do the menial tasks! Picture me in a lavender satin dress, petticoats so large I knock the whiskey glasses off the tables, lots of ostrich feathers, a good amount of rouge (that's blush to you young 'uns out thar! ), my hair dyed an electric shade of pinkish red, big bosoms proudly heaving in my decolletage, enjoying a "snort" while my "girls" earn their keep upstairs adding more silver dollars to my coffers! Madam Diva welcomes you to her establishment, The Fabulous Fallen Females of Fable Falls are here to entertain you! Put yer pistols behind the bar, grab yer girl and commence to pokin . . . . . .and remember, you'll have to put your dollar on the dresser, Dearie, before we drop our drawers! This week's Old School Friday theme is Criminal Records - I had to think about that for a moment. Nowadays you have to get arrested or you can't sell a CD, let alone tickets to C-note concerts, so coming up with a band or song is a cinch. 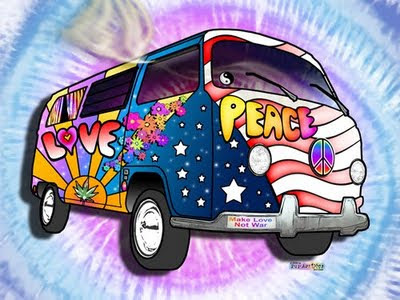 Of course, I'm Ms. Retro so I was cruisin' through the sixties in my mind for a song or singer with a "criminal record". I'm not even sure this is exactly what the theme means but that's my take on it, lol. In my day our rock stars were getting arrested too, most of the time for drug convictions - it was the sixties after all - but it was still shocking to a generation slowly creeping out of the uptight fifties. I remember just about every top band or singer being pinched for some substance abuse violation including but not limited to The Stones, The Beatles . . . oh jeez, why bother? Just figure any rock band from the sixties spent some time in the slammer, lol. When I saw this theme though the very first thought that came to mind was Jim Morrison's (The Doors) arrest for indecent exposure in 1969 in Coconut Grove, Florida. This was sort of the start of a great number of historical and infamous incidents that happened in 1969 - don't forget that was the same year we landed on the moon and invaded a small upstate NY town for a little party called Woodstock - and I remember the incident quite clearly. I remember being a little shocked - even though by that time I'd been to a couple of his concerts and knew he was what my Mom would have called "wild". OMG, she had no idea, lol. 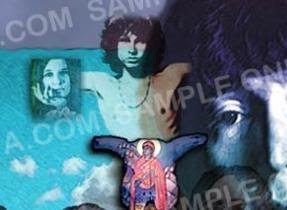 Also keep in mind that Morrison's nicknames were Mr. Mojo Rising and The Lizard King. Still, I was only 5 years out of Kansas and some of the hayseed was still stuck in my hair. For young girls like me part of Morrison's charm - actually a very large part - was his bad boy behavior. The tight black leather jeans and the "poetic soul" didn't hurt either. What is it about those bad boys? I'm posting my very favorite of The Doors - Light My Fire. It's my favorite because it had a long version and that long version was a perfect length for cruising to and by all our favorite hang outs with the radio blasting. Yup, nothing like a coke and an order of fries from The Freeze while Jim blasts out of the speakers "Come on baby, Light My Fire" Sure Jim, be happy to. Thanks to a comment from Pjazzy below I found a video of the actual performance of The Doors on the Ed Sullivan Show where they DIDN'T change the lyrics to Light My Fire. The Doors are on this video twice - once singing People Are Strange right at the first and then later singing the infamously unchanged Light My Fire. BTW, you'll also see The Beach Boys and a few other gems of celebrity appearances on this video! Enjoy! I'm working on formatting one of my Carousel Drawings from the 80s for my new store Carousel Corner. Back then I fell in love with carousels and merry go rounds and did a whole series of colored pencil drawings based on some of the most famous carvings - Dentzel being probably one of the most famous and well known. I recently came back into possession of a lot of my art from years past and when I opened the portfolio and saw the photos I decided to digitally "remaster" them and put them up on a store just for carousels. Today I'm getting the Lion and Tiger done and will get all my products done for them sometime later today or tomorrow. 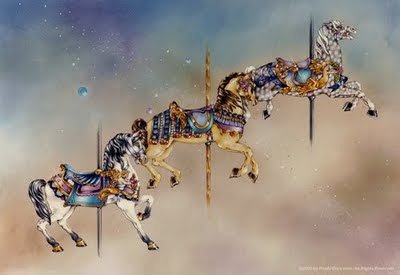 I already have several of my horse carousel drawings, cats and a carousel rabbit done and on the store on tees, cups, posters and other gear. 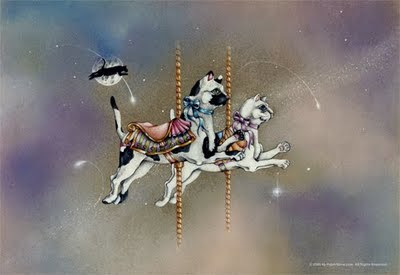 These are the most adorable images for children's rooms - not to mention the childlike adults who love carousels. The beautiful carvings done in the 1800s and the early 1900s by carvers like Dentzel, Muller and others were so intricate and just beautifully painted that I kept my drawings pretty faithful to the originals but I have made some "artistic" changes to suit the drawings themselves. Funny, I never really think of going back in my art life and revisiting it and that's silly. Art is one of the things that never ages, never loses it's value over time and never becomes passe. These drawings are still lovely, whimsical and - if I do say so myself - beautifully drawn. I guess you can go home again - if you take your crayons with you! I'm heading out to do some fun things today - like see a movie and shop at Trader Joe's and my lazy little play oriented mind couldn't come up with anything for the Thursday Thirteen this week except for all the new art I've been doing for my Zazzle stores and stock photo image sites so, without further ado, here are some of the newest designs on my stores & upload sites. Ok, it's shameless self promotion but more importantly it's a thorougly lazy solution so I can go out and have some actual fun for a change - don't judge me too harshly, lol! 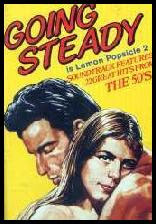 I'll let you know how the movie was. . . .
Back in the sixties when you were dating someone you usually ended up in an exclusive relationship - we called it going steady. You'd trade class rings and everyone would know you were together - probably because you always were! If you had a boyfriend or girlfriend you pretty much spent all the time between classes glued to each other in some way, either arms around each other, kissing in the hall, hands hooked in pockets or belts. When you dated in the sixties it was a long term thing and not today's concept of "hooking up". One of my favorite songs while dating one of my high school boyfriends was "Happy Together" by the Turtles. I loved that song and it became our song while we "went steady" - later I think our break up song was "Heard it Through the Grapevine", lol. Yes, I went out with someone else before I "officially" broke up with my Happy Together guy - my bad. Hey, I never said I was an angel, ok? Somehow these two songs never got plastered with the bad aura of my bad behavior and the break up and I have always loved them.